Ali Momeni’s 2015 Caress v4 and Caress v5 are the fourth and the fifth iterations of a small, handheld electro-acoustic percussive instrument based on the concepts of lightweight design, portability, and ergonomics. 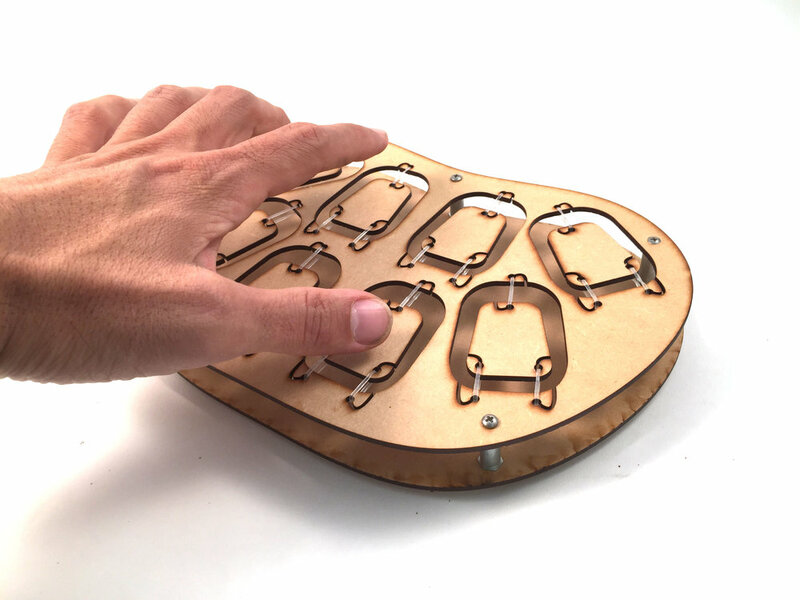 The device features a symmetric array of eight finger pads constructed to fit the user’s hand shape, each of which are connected to piezoelectric microphones that communicate information about user inputs using vibrations. In the demonstration video, Ali connects the device to Ableton, an advanced music production software, which allows the user to customize the sound that each pad produces and curate unique sound packages for a simple, personalized beat-making experience. The device, being based around simple, lightweight design, is constructed from sheets of laser- cut acrylic and wood which produces a polished yet unintimidating appearance, inviting the user to try with little trepidation. The features allowing customization of the sound profile paired with the device's inviting appearance present to the user a collaborative mindset of fluid, user-centered music production that conforms to the desires of the curator. With its small form factor, the project encourages one to bring the music experience anywhere they go. This statement is the origin of the entire concept behind Momeni’s work. In current musical practices, it has become increasingly popular to use electronic devices to create music. DJs using filters and buttons to mix hit tracks are skilled, however the creation of music with emotion and intimacy between the artist and the instrument is rather hindered when the instrument is electronically actuated, subjecting the output tones to calculated, binary representations of the initial intention. The work focuses on an expressive, enactive performance experience which allows the nature and subtlety of the artist’s actions to dictate and directly control the nuances of the sounds that are produced. The result is an electronic instrument which blurs the line between binary, unresponsive electronics and sensitive, fluid musical expression. Caress ends up feeling less like a device and more like an extension of the user. The fabrication methods used in this piece also add value to its interpretation, conveying a DIY mindset showing that new, innovative ways of thinking can be easily realized. This piece’s iterative transformation process is clearly influenced by the Maker Movement, a recent development in the methods and interactions of independent innovators worldwide. Expansions in the availability of open-source code, fabrication technologies, and information systems which allow people to learn how to use these new tools has enabled creative minds to become avid DIYers without needing access to industrial machinery or teams of designers. This increased access gives people across the globe the ability to tinker with their own projects and ideas, empowering them to do more than imagine. People are able to truly express themselves in their work, and create physical hardware and personal software exactly how they intended. The ease with which Momeni was able to improve and develop his design and the ability he had to realize his inspirations were made monumentally easier by his access to the proper tools and information required. The laser he used to cut the wood and acrylic, as well as the components, circuitry, and code he had to develop, all are part of a collective interest in self-sustaining prototyping and inspiration. In a way, these tools are reflected in the vision of his work: The user should be able to curate the sounds in their own way, unique to themselves, and that no two performers with his instrument will use it the same way. Momeni is a true Maker, embracing the natural creativity of the user, encouraging them to create their own palate of sounds and share it with the world. Tenori-On, 2003. Courtesy of MOMA. With advancements in electronic components’ performance and costs, digital instruments have become incredibly popular as they are more and more accessible to enthusiast consumers. The Tenori-On, created as a collaboration between the Japanese artist Toshio Iwai and Yamaha in 2003, is a stellar example of this emergence. Similar to Caress, this work is a small, portable electronic musical instrument which is meant to provide a unique and inspiring experience for the user, regardless of their skill level. The Tenori-Ongives the impression of a more highly-polished, consumer-market-ready product, partially due to the resources and expertise at Yamaha’s disposal, as they were tasked with the production of the device. The handheld instrument has a signature array of sounds, controlled by a square array of simple LED-lit buttons encased in a metallic plastic frame. While it may be more well-developed in a production and quality sense, the Tenori-Onis limited in terms of its ability to communicate and interact with the user. The Tenori-On has a limited library of sound profiles, and its buttons only allow the user to set the sound to on or off. Momeni’s focus with Caresswas to enable the transfer of emotion to the instrument past a binary level, which the Tenori-On and its on/off buttons cannot accomplish. Caress offers waveform-based touch response, as well as a nearly infinite set of sounds that can be programmed specifically to the user’s taste using the drivers and that Momeni produced to enable Caress to interact with various computer software. Wave, 2018. Courtesy of Genkiinstruments on Indiegogo. Another inspiring musical device focused around the communication and interpretation of organic, fluid human intentions during the music production process is Wave, a product released on Indiegogo by genkiistruments, a company focused around expressive digital audio production. The device is a simple ring that sits around the user’s finger, using an array of various sensors to detect the motions of the user’s hand. These motions are sent as MIDI signals to music software on a controller, phone, or computer, and controls the music according to the user’s settings. Wave has very similar goals to Caress, but accomplishes it in a more modern and compact form factor. Wave may be built for a musician who already plays a specific instrument or prefers to DJ on a deck, but needs some extra flair and control over nuances in their sound. Unlike Caress, Wave has few controls and is entirely gesture-based. Both devices are marching towards a new frontier of digital music with more depth and organic virtues that communicate the sensations envisioned by the artist. With further research and development, Caress has potential to inspire new ways of thinking about music production in an exciting, collaborative, and human-centered way. Collaboration between human emotion and digital interface opens a huge door to a world of electronic music that acoustic and electronic instruments could not accomplish alone. Momeni is opening up the possibilities of what professionals and novices alike can create using just a few simple tools and some creativity.